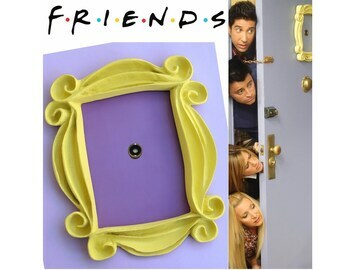 Perfect gift for your friend who LOVES Friends !! 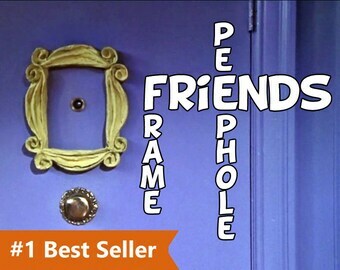 Who could forget Monica's iconic yellow peephole frame? Get one of your own to hang on your apartment door . 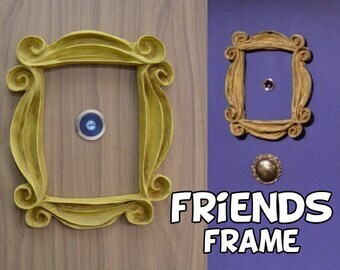 Replica of the frame that was in the peephole of the door of Monica's apartment in the Friends series. 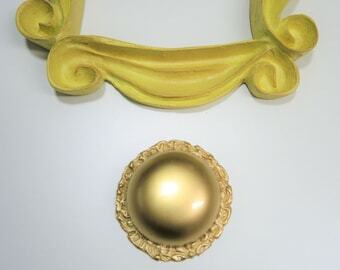 This reproduction is made of special resin for decoration and hand painted. 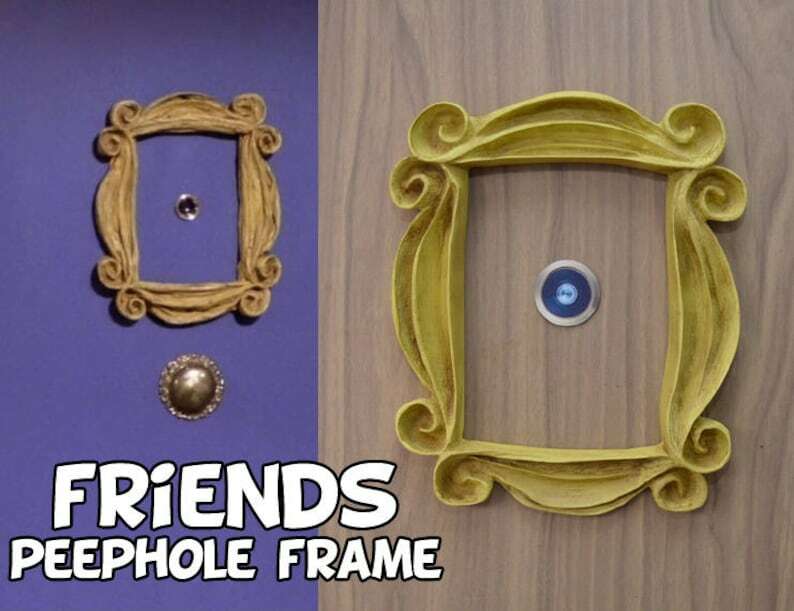 If you have a good eye and you do not fit to hang anything behind your door, you can see that this is the most faithful replica of the original frame of the series you can find. 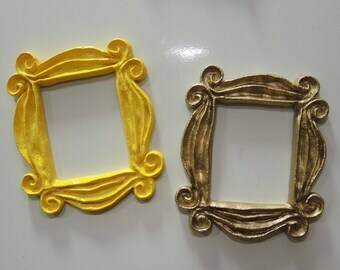 This frame is finished with a nice aged yellow color. Vintage style !!! Also available in other colors: yellow and gold. dimentions in centimeters : 26cm x 21cm on the outside ---- 17,2cm x 12cm on the inside . The frame includes an imbedded sawtooth hanger. 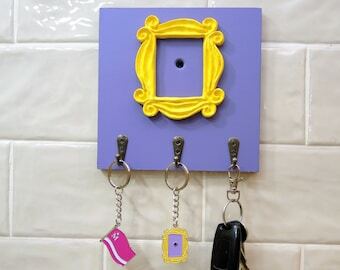 You can hang the frame easily anywhere. 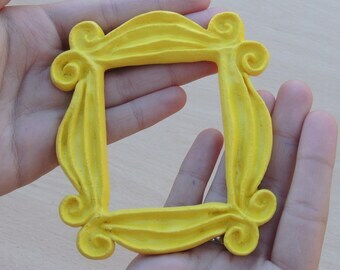 , if you want to hang it as a picture you will not have a problem because it is prepared for that. 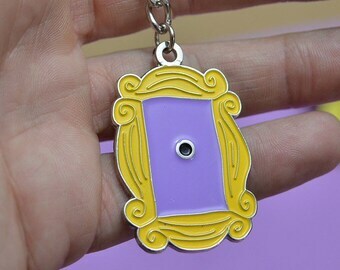 Anyway you can always remove the hanger as it is subject with two small screws and put it on the door as you prefer. 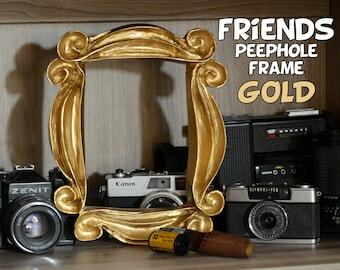 I will include a picture if you want to put it behind the frame, on one side has the picture of a peephole and the Friend's logo in the other side. It is the ideal gift for a fan of the series... You'll love it! I will try to send as quickly as possible and I will let you know immediately when the frame has been sent. I will ship worldwide by registered airmail (you'll need to sign for the package), very well packaged. Super satisfaite !! 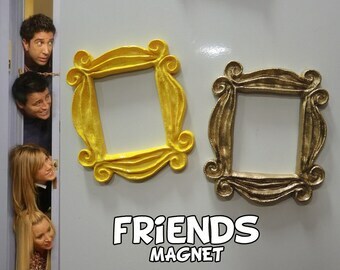 Je recommande pour tous les fans de Friends . La réplique du cadre est parfaite !! Livraison au top très rapide. All items will be carefully packaged and sent within 3 business days after payment is received! (if we need more time, you'll find it in item description). • Please make sure your Etsy address is correct, I am in NO way responsible for a package that was not delivered due to an incorrect or undeliverable address. •All orders will be shipped with First Class Airmail from Spain. It includes tracking number (it will be sent in e-mail notification). A signature will be required to delivery the package. For most countries, in case of no authorized recipient available, the local post company will leave a notice. You may arrange a re-delivery or may pick up the item at the Post Office indicated on the notice. If this item is unclaimed after 15 days then it will be returned to the sender. Please note: some local postal services do not provide on-line tracking for international registered airmail. Such as: Germany, UK, France, Italy and Australian post. So I can track your package only while it's in Spain. 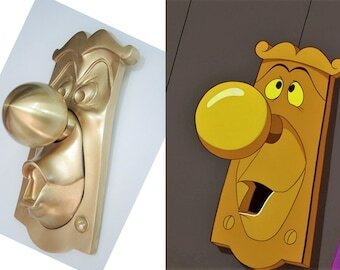 Walt Disney Alice in Wonderland Mr. Doorknob. Functional door knob set. Decorative or complete kit. Ready to ship in 3-5 days !! !